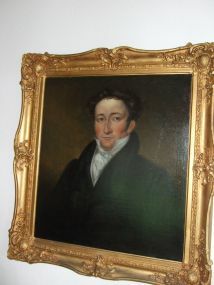 My uncle has a painting in his living room of someone who is believed to be a COLE ancestor. He asked me to see if I could find out his identity. 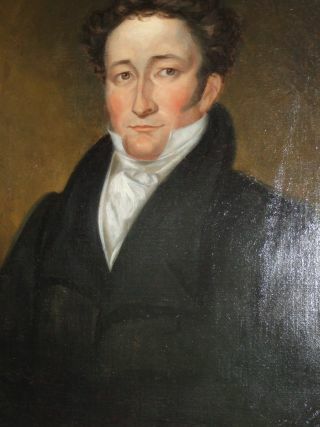 Having made some enquiries we think the painting is of a gentleman dressed in clothes and wearing sideburns that would have been popular in the period 1815 - 1820 and that he is about 35 – 45 years old, as his hair is still very full and shows no sign of receding. This would put him as born around 1770 – 1780 making him the father of THOMAS COLE (born about 1795) and the grand-father of MARY COLE. We know that MARY COLE married Thomas BENSON in Islington on 28th October 1841 and that at the time of her marriage she was resident at St Pauls Terrace. The marriage certificate shows her father as THOMAS COLE, described as a “carrier”, which I understand was a driver of horse-drawn vehicles for transporting goods. The person in the painting looks like a land owner to me with a few bob rather than a worker. This leads me to think it is almost certainly not him in the painting. Witnesses of the marriage look like “S.Cole and Annie Cole” but it is difficult to be sure. One of Thomas and Mary’s children was named Annie (born 1844) which suggests it could also have been the name of her mother or grandmother ? We know from census information that MARY COLE was born in Worcestershire about 1819 – her age is consistent in each of the censuses for 1851, 1861, 1871 and 1881. I have not traced her on the 1891 census and therefore she may well have died sometime after 1881, making her at least 62. I have since found MARY COLE’s christening on 25th November 1818 at St Martin, Worcester with parents THOMAS COLE and SARAH COLE. Was this where the Cole’s came from ? St Martin’s, Worcester, is an Anglican Church with a Catholic style of worship. The Church is in Cornmarket, Worcester WR1 2DF. The story of Thomas and Mary BENSON is documented elsewhere. In order to work back to ascertain details of Mary’s parents I traced MARY COLE to the 1841 census where, luckily, she was living with her mother, SARAH COLE aged 45, at the same St Pauls Terrace address as she was 6 months later when she married. This could be the “S.Cole” on the marriage document ? No sign of SARAH COLE’s husband ? SARAH COLE was therefore born about 1796. My personal conclusion is that this is a painting of THOMAS COLE’s father who would have been born around 1775. He may well be a landowner and a man of wealth. As such, he should be traceable ! What was Mary’s mother’s, SARAH COLE, maiden name ? When were THOMAS COLE and SARAH married (before 1818) ? The only possible hit I had was a marriage between THOMAS COLE and SARAH JONES on 2nd February 1818 at Claines, Worcester. However, this may be incorrect as a SARAH COLE from Claines, Worcestershire born 1796 is on the 1861 census in Broom Village, Broom, Worcestershire married to a JOHN COLE rather than THOMAS COLE ? Did Thomas Cole die and she married a John Cole ? Unlikely ! When did THOMAS COLE die ? I have found a copy of his Will which was proved on 24th February 1840. This fits in with the fact that I couldn’t find SARAH COLE’s husband on the 1841 census (Mary was living with her mother) and that possibly Sarah remarried after his death. In order to take this forward, my next trip will need to be to the Worcestershire Record Office.